If you workout frequently and diet wisely, you are probably already familiar with one of the most utilized supplements—protein powder! Protein powder has been around since the fifties and has gone through many evolutions over the years. Throughout its many transitions, one thing has remained constant—protein powders are a quick and convenient source of high quality protein that can help kick-start recovery and keep your muscles supplied with amino acids throughout the day to support muscle growth and preservation. Despite what you do know about protein powders, you probably have a few questions that have remained unanswered. In this post, I’m answering five of the most common questions surrounding protein powders. Question #1: What’s In Protein Powder? Although almost anything that contains protein can be made into a powder, the majority of protein powder supplements on the market today come from dairy sources. Dairy can be processed into whey isolate, whey concentrates, whey hydrolysate, caseinate or even basic milk protein. 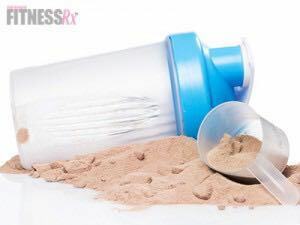 Many protein powders contain a mix of a few of these sources of protein within one blend. Pure isolates and hydrolysates are fast absorbing and are best used for post-workout recovery. Whereas, blended proteins can provide a mix of fast and slow digesting proteins that can help sustain protein balance and reduce appetite between meals. Whey Protein: Whey blended proteins may include an assortment of at least the three types of whey protein available – Isolate, Concentrate and Hydrolysate. Isolates are the purest form of whey protein at 90% protein and contain very low amounts of lactose or fat. Concentrates provide 80% protein and a higher concentration of fat and lactose. Hydrolysates undergo a special enzymatic process to partially hydrolyse the protein into smaller peptides making them fast absorbing. Caseinate Protein: Caseinate protein is often found blended with whey protein or other protein sources. Caseinate protein is an extremely slow digesting protein. In fact, it can take up to 7 hours to be fully digested, which makes this protein excellent for nighttime recovery. Caseinate blends can provide a slow and sustained release of amino acids into the blood stream, which can help maintain muscle nitrogen balance. Caseinate is also an excellent protein for dieters since the gel-like substance it forms in the gut allows for a slow steady release over time helping to keep appetite in-check! Vegan Protein: Vegan protein blends may contain soy, rice, hemp or even pea protein. Vegan blends offer a variety of vegetarian proteins blended into one powder to ensure a full complement of the essential amino acids. Although soy protein does contain all the essential amino acids, it doesn’t offer them up in the right ratios. So adding in other vegan sources ensures the right mix to assist in muscle building and maintaining hard earned muscle. Vegan protein blends are perfect for those with lactose intolerances and vegetarians. Question #2: What Else Is In Protein Powder? Unless you purchase an all-natural, unflavored protein powder, your protein powder will be blended with flavors, suspension compounds, sweeteners and possibly a few other supportive ingredients. Flavor systems can be natural and artificial, as sweeteners may include various levels of stevia, aspartame, sucralose and/or acesulfame potassium. Suspension ingredients help keep the protein suspended in the solution with which you mix it. Suspension ingredients can include natural gums such as xanthan gum, cellulose, guar or carrageenan. These ingredients do not add any additional calories and most act as fibers in the body. Some protein powders provide added muscle building ingredients such as BCAAs, glutamine or even creatine. Protein powders may also provide added enzymes such as lactase, bromelian and amylase or prebiotics like inulin or fructoligosaccarides to aid with digestion. Question #3: Are Protein Powder Labels Accurate? One thing that should be pointed out is that the law does allow for a wide variance of up to 20 percent of the stated value of any nutrition facts label. That means a 100-calorie serving could in fact be providing 120 calories and still be within label guidelines. There has also been some concern over “protein spiking”—when lesser quality proteins and aminos are used to spike protein content. The best way to make sure you are getting a good, high quality protein powder is to purchase a product from a manufacturer that uses a government audited production facility that practices cGMP (current good manufacturing processes) and tests their products using third party validation. Reputable companies will follow strict guidelines to ensure they meet quality standards and deliver a quality product. Look for a cGMP certification on the label or on the company website. Question #4: Does Protein Powder Denature If It Is Cooked or Baked? Just like when cooking a piece of meat or eggs, heating or baking causes de-naturation or change in the structure of the protein. However, this change doesn’t mean the protein is less desirable, nutritious or effective. Heat can change the structure of the active peptides and can destroy added digestive enzymes or pre- or probiotics, but it will still provide you with a great source of protein when added to any of your favorite recipes that require heating or cooking. Question #5: How Much Protein Powder Is Too Much? Like any supplement, protein powder should be used as a supplement to whole food. Protein powder is a convenient way to get in a quick source of protein when you are short on time and without a meal. Daily protein needs for athletes and those looking to gain and maintain a lean and muscular physique are 1 g to 1.5 g of protein per pound of bodyweight. Consider using protein powder 1 or 2 times per day to help meet this daily requirement. Protein powder can provide 20 to 30 g of protein per scoop, depending on the protein. Make up the rest of your protein needs with solid meals. Tariq MR, et al. Nutritional and Therapeutic Properties of Whey. Annals Food Science and Technology. 2013. 14(1): 19 – 26.